Brought to you by Sentara Healthcare, we improve health every day. This year’s Marine Corps 17.75K event sold out in a record 7 minutes and 25 seconds. D.C. “Running Pack” members Melisa Augusto, 35, Rudy Alvarez, 36, and Kevin Jordan, 48, were eager to nab their entries, waiting by their computers and counting down to registration. Access Granted! On Saturday, the Running Pack returns for their third 17.75K and looks forward to their fourth Marine Corps Marathon together. One step closer to reaching their goal of getting into the MCM Runners Club so they never miss a Marine Corps Marathon. Collectively, the Pack members have run 107 races over the past four years and have marked their calendars each year for Marine Corps 17.75K and Marine Corps Marathon. The MCM events have made such an impression that the Pack’s training season is centered around the MCM. Great Community Engagement – You can feel the energy and support from the Marines and spectators at any MCM event. Socialize – Getting to meet new runners from every corner of the world. Group Support – Continuous motivation from their Pack members to claim the coveted metal at the finish line. Train together, Celebrate Together – The event doesn’t end when the Pack claims their medals. They continue to celebrate their success with a night out on the town. Exclusivity – Being a part of the 3,100 at the 1775K that will run together again in October. The Running Pack enjoys the 17.75K’s winding trails and that the race experience is different from the Pack’s training ground of the D.C. pavement. The first year the Running Pack participated in the 17.75K, they arrived among the first runners at the event space and prepared eagerly to run for their golden ticket. 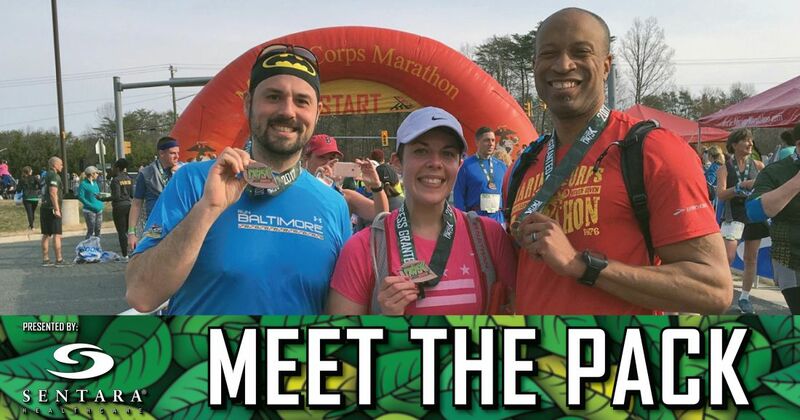 Unforgettable memories are made through the trails of Prince William Forrest Park and the D.C. Running Pack looks forward to many more shared running accomplishments with the Marines. Sentara Healthcare in Northern Virginia is proud to be the exclusive healthcare sponsor of the 2018 MCM Event Series and looks forward to meeting Melisa, Rudy and Kevin and all the 17.75K participants at the Sentara tent in the finish area. To learn more about local Sentara Healthcare services, visit Sentara.com or call 1-800-SENTARA. My Health. My Community. #MySentara.